You are here: Home / PTC / Creo / Rethinking Simulation: Should you take another look? Rethinking Simulation: Should you take another look? Not that long ago, design and simulation were done by different parts of the engineering staff. This made sense because simulation required specialized skills and the tools were hard to use. Moving models from CAD to CAE, simplifying and repairing them, and ensuring that the forces were correct all required an expert’s touch. Each cycle took a week or two, which meant that the simulation results were always a bit behind the current state of the design. It was less than ideal but it was the best we could do, given the hardware and software available at the time. A lot has changed in the last five years and it’s time to take another look at how simulation can help your business be more competitive. Finite element analysis is a type of simulation that looks at how external loads affect the behaviour of mechanical and structural systems. The finite elements make up a mesh that represents the geometry of a part or assembly. Like the flat planes on a soccer ball, the more elements, the more accurate the representation. But the more elements, the slower the simulation solves. The analyst must also define the material properties for the part, the loads and any boundary conditions, or how the part or assembly is constrained in the real world. Setting up the simulation is called pre-processing. Once the simulation is ready, it’s sent to the solver. The results are returned back to the user for interpretation. Modern tools make this much simpler; colours and deflections show areas for further refinement. It’s still true that what makes a good CAD model often makes for a less than ideal CAE model. For example, small gaps or fillets that are perfectly acceptable in a CAM-centric CAD model can wreak havoc in a simulation as too many details will slow down convergence and gaps can lead to inaccurate results. 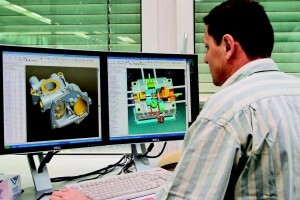 But CAE software has gotten a lot smarter, and many specialist CAE codes now work with native CAD models. In some cases, they even integrate the two using plug-in architectures to maintain associativity. PTC Creo Simulate takes this one step further, integrating CAD and CAE so that you can get the best of both. PTC Creo Simulate lets you analyse the structural and thermal performance using the same UI as the rest of the PTC Creo family. You model in PTC Creo Parametric as per usual then apply loads, materials, and boundary conditions to the design geometry in PTC Creo Simulate. When they’re ready, you examine the results on that same geometry. If you need to do a nonlinear or other advanced analysis, you can use the PTC Creo Advanced Simulation Extension or send the simulation to a specialist code. There’s one more benefit to using PTC’s integrated CAD/CAE. PTC Creo Flexible Modeling Extension allows you to edit and modify models that have been imported, which you can then analyse in PTC Creo Simulate. PTC’s data management solutions can help you manage design iterations and alternatives. With PTC Creo Simulate, you never have to wonder if your simulation uses the latest, correct CAD model because it’s in the same workflow stream, not in a branch. PTC Windchill can help you manage all of the data involved in the simulation, ensuring that the CAD model, bills of material, results and load cases are linked and stored. Adding it all together, the PTC family of CAD and CAE tools enables you to assemble a variety of input models, from many sources, and validate their use cases throughout the design process. You and your design partners and suppliers get better insights, earlier. How do you get started? Whether you use PTC Creo Simulate or another CAE code, start small. Try it on a modest part, then grow your expertise to more complex assemblies — but understand that it may take some time to be fully confident in your results. Take classes to understand how to set up the model and interpret the results because one of the risks of simulation will never go away, no matter how good the toolset: garbage in leads to garbage out. At best, you’ll waste time; at worst, you might make decisions based on erroneous results. Over the last five or ten years, we’ve seen significant advances in the capabilities and usability of CAE tools. The visualizations are better than ever, making it easier than ever to interpret results. You can create the inputs for a finite element analysis in minutes, solve it in hours not days, and use the knowledge you gain to make valuable design decisions.